RKNA Standard Evaluation › Rottweiler Klub of North America Inc. ENTRY REQUIREMENTS: Originals documents must be submitted to the Show Secretary on the date of the evaluation. The dog must have a passing hip and elbow rating with OFA, ADRK or FCI. Passing hips defined: OFA Excellent, Good or Fair, ADRK HD Free or HD+/-, or FCI HD A or HD B. Passing elbows defined: OFA Normal, Grade I or Grade II, ADRK ED Free, ED+/-, ED+ or FCI ED 0 or ED 1. Permanent identification (tattoo or microchip). If a dog is AKC registered, the dog must have paperwork tying the AKC registration papers into the dog such as a letter from their vet stating they have been presented with AKC registration papers stating the registered name of the dog and the permanent identification found on the dog. New as of 2018: As of 2018, owners whose dogs pass an RKNA Inc. SE under an ADRK judge can also apply for ADRK BSE certification. Policy Manual: The SE is not a breed survey. Dogs that pass are certified that the dog has a passing hip and elbow rating, confirms full dentition and correct scissor bite, and is free of disqualifying faults under FCI standard with correct temperament. If a dog has an SE and loses a tooth, the dog may still attempt the Ztp. Dogs can only attempt the SE three times. Upon the third failure, a dog may not attempt the test again. Article by John Bernard: The Standard Evaluation, or SE, is a test offered by RKNA that certifies that a dog has met the qualifications necessary to make it eligible for a breed test. It is not meant to replace an actual Breed Test (or ZTP), which is a certification deeming the dog as suitable for breeding. The Standard Evaluation is done by a qualified judge, who must verify that the dog does not possess any disqualifying faults as compared to the FCI breed standard. Minimal temperament testing exercises are performed by the dog in front of the judge and a crowd of people to determine the dogs soundness of nerves, stability, and a minimal test of confidence. The dog will be walked on leash closely through a group of people, and asked to perform minimal exercises like sit and down in proximity to the group. It is up to the judge to determine how difficult these exercises are, and if he or she sees something in the dog to warrant uncertainty about the dog’s temperament, the judge may repeat exercises as needed to determine clarity. A visual examination is done by the judge while describing the dog’s conformation, and this is recorded on the SE certificate as the “critique”. The dog is described from nose to tail, and his movement is also evaluated…… The ADRK World Family also offers this test, although it is called the Breed Standard Evaluation (BSE). One of the main reasons that ADRK started the World Family was to help to introduce a concept of breeding better dogs outside of Germany and to the rest of the world. ADRK recognized the need for this sort of test because IPO sport and protection type training is very limited or at very least different outside of Germany. And like RKNA, ADRK created the BSE to encourage breeders around the world to strive to prove their breeding dogs are sufficiently correct as compared to the FCI breed standard. Also like RKNA, the dogs must also possess certified hips and elbows, and are at minimum stable in character. It is the hope of RKNA that we can work together with the ADRK World Family to create a certification program for judges so that they are very familiar and qualified to judge SE’s and BSE’s all over the world. 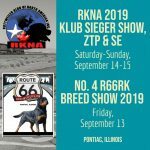 This is not always a given, since many countries have never had this test offered, so it is understandable that some judges are not familiar yet with the process……..
RKNA again stresses that the SE is not meant to be a cheap replacement for an actual Breed Test or ZTP. The ZTP test involves a much more complete test of temperament, also evaluating specifically the protective characteristics of the rottweiler which is one of the most important attributes of our breed. However, because it is well known that a ZTP requires more training than an SE, and in the vast majority of cases also requires the ability to train with a safe and experienced helper, many people are simply unable to prepare their dogs for this test. Also, in some countries and certain other areas protection training is illegal, making the acquisition of a ZTP an impossibility. In those cases, the introduction of the SE creates a system where at the very least, breeders can prove that their dogs are suitable to qualify for a Breed Test. This is a huge improvement in many areas of the world where breeders simply post photos of the parents of their litters without any certifications whatsoever. It will take some time for this concept to catch on, but RKNA hopes that the SE will be offered at all events, and as a result training for this will eventually be much more easily attainable for everyone.